Luther College seniors Clare Slagel, swimming, and Justin Kreiter, wrestling, have been awarded a 2017 NCAA Postgraduate Scholarship. University of Iowa senior linebacker and Decorah native Josey Jewell, along with senior offensive lineman Sean Welsh and junior offensive lineman James Daniels, have earned preseason All-America from Athlon Sports. Sara Anundsen O’Leary has been named the head coach of the University of Virginia’s women’s tennis program. Decorah native C.J. Cliff was honored with his third letter as a member of the Central College men’s tennis team. Seven Luther College softball players were named to the Iowa Intercollegiate Athletic Conference (IIAC) all-conference team, four on the first team and three on the second team. Anna Madrigal, a 2013 graduate of Decorah High School, was named the Luther College women’s basketball team Most Valuable Player for the 2016-17 season. Luther College junior softball player Anna Strien has been named second team Division III Academic All-America® Softball Team, as selected by the College Sports Information Directors of America (CoSIDA). Luther College track and field head coach Jeff Wettach has announced 11 Decorah High School graduates are 2017 letter winners. Six members of the Luther College baseball team have been recognized on this year’s Iowa Intercollegiate Athletic Conference (IIAC) all-conference baseball team, as selected by the head coaches. South Winn and Luther alum Darin Monroe continues to win. The Iowa Intercollegiate Athletic Conference (IIAC) has concluded its 2016-17 regular season calendar. Three Luther softball players were named National Fastpitch Coaches Association (NFCA) All-Americans. The Decorah Norse Athletic Association Benefit Golf Tournament will be held Monday, June 5, at Oneota Golf and Country Club. 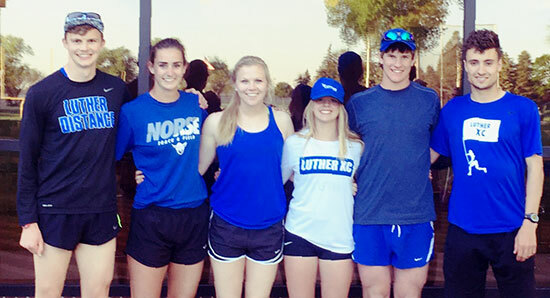 Luther College had six netters named to the Iowa Intercollegiate Athletic Conference (IIAC) 2017 all-conference tennis team as selected by the head coaches. Luther College senior Joe Silversmith has been named to the 2017 D3baseball.com All-Central Region team as a second team honoree at third base.